To all Mobsters, Fellow member seeking your support! 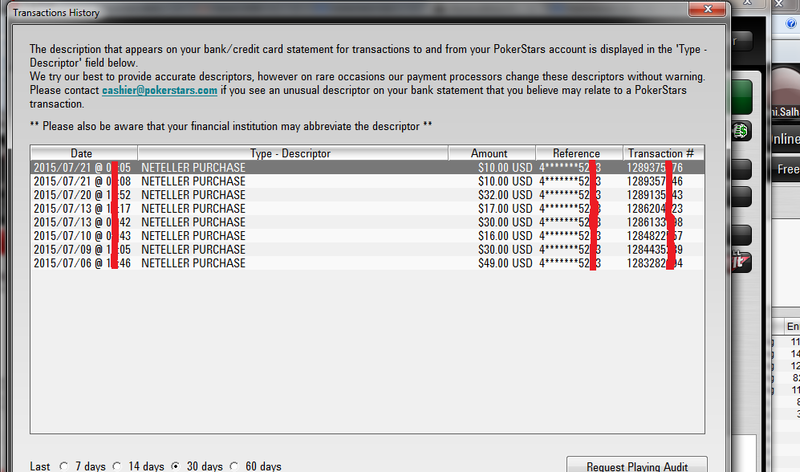 So basically I require less than 30 VPP to achieve SilverStar, I have already made the maximum deposits I am allowed for this month and I wont be able to make an additional deposit due to Gambling restrictions which i recently limited to 195$/ month. I was losing 500$+ a month and I needed more management so I restricted my account into 200$/month.. never knew it would backfire on me that way! My only chance is to get help from a fellow Mobster here, and transfer me some funds which I will return with a 20% increment on the original loan amount. The max I need is 10$, and guys, anything between 1$ and up would be great help as I will build up my bankroll very carefully and focus on getting the required VPP's. Please guys dont let me down!! This is the first time i Depend on you fellow mobsters! P.S: My pokerstars name is shown above, feel free to search me yu will realize I am a very old player and played over 20,000$ minimum worth of poker games. You are saving $300+ per month now compared to when you did not have the restriction set. Don't worry about that $10 stellar reward. The restriction is working great for you, perhaps it's best to leave it at that (sorry about the unsolicited advice, I mean well). I am satisfied with my current deposit limit, I will not change it for any future reasons, however reaching the silver status is very important as well to open a bigger doors for me next month. Silverstar really doesnt open any doors. U get a few extra points and a 100point freeroll on saturdays. I wouldnt break the bank nor chance a bad exchange with a mobster over it. Id lend u 10$ but ud havta pay like 5$ in rake to make ur 30vpp so doubt it would be enough. I would appreciate your support and I believe I will manage to accumilate the required rake as i got 6 days left. I will slow play it on slow tables. You finished the tournament in 365th place. I played plenty of cash games increased my bankroll to 23$..then i increased the table and buy in to get the required VPP quickly, ended up busting all my bankroll now am back to 0.23$. If you can provide me with the 2nd chance to accomplish my mission, I would highly appreciate it and note your support for me on this month. Ok bro, I cant say that you were not helpful to me because you were, the information you mentioned above about the 1.5$ buy ins, is really valuable information to me. I always thought ZOOM cash games are always the best way to accumulate VPP,turns out i was wrong. I also believe that even though I am an OK poker player, my passion for big MTT's always leaves my bankroll bust since i always aim for the high buyins, especially the hyper turbo. You are right about the gambling part and hopefully I intend to improve my play to try and win some of the losses i have lost in the past 4 years...but thats another story. Hope to see you at the tables one day ! No need for that. You keep it. Just do us as Mobsters, and more importantly yourself a favour and stop asking for money and start focusing on fixing you game. Study a little... then study some more. Watch videos, then watch more.... Read anything that anyone who has played poker, walked the same road that you are walking down now, has bothered to take the time to write down. Learn from it. Ask questions. Seek answers. Improve. Don't have a target to obtain a certain VIP level, don't have a target to win x amount of money or to move up to x limit... Have a target to get better at the game. Use that as your motivation. Be proud when you learn something new and use it successfully at the tables... be angry at yourself when you make mistakes. Learn from the good players, and from the bad alike. Information is everywhere. Use it. And just one last point... You say you are a very good player, but have very bad bankroll management and are prone to tilt. These are two VERY bad leaks... and regardless of any other skill, make you a very BAD player. Fix these leaks first - they are mindset leaks, not skill leaks. They are the basis for doing well. Secondly, I am totally aware that those "leaks" we are talking about are the reasons I am considered as a losing poker player... I recently left my job as I was working in a bank, and now I intend to make poker as my main income, and focus more and study to reach at least halfway towards my goal of becoming a poker pro. The main reason for my decision, is my love and passion for poker, thus i decided to practice and play more carefully, learn, watch and grow to clog my leaks and turn my hobby into a decent income. The first step was limiting my monthly deposit limit and manage to build a bankroll with more wisdom and management. You finished the tournament in 430th place. A USD 0.50 award has been credited to your Real Money account. But i believe I am doing really good past two days, when i started focusing and when i read some articles here and on p***********y.com, it seems that I am always getting into the money in my recent tournament plays.. had an excellent play at micromillions, if i didnt bust on that bad beat i couldve reached final table! most of my tournaments today were doing great! i see a bright future!!! Lol goodluck man.not bustin ur balls about gambling, im probably the biggest gambler on this site lol. Just like to know if im giving someone money to reach a goal there using it the best possible way to achieve it with least amount of risk. Goodluck on reaching it. Hey bro do u have skype? or whatsapp or something? I will stake you in the following games. You will need to play any of these 18 times to meet your goal. If u promise to stay on track i will ship 27$ over for 18 buyins. We split any profit 50/50. Ill ship now if u agree. You will havta play a few regular not turbos to get an extra .18vpp. Public humiliation is nothing compared to my word. so let me clarify this, I need to play any of the 1.5$ games 18 times. I prefer to play on the 6max/hyper tho not turbo, and a bunch of 18 or 27. does it mind if I play the hyper game? I agree on your offer, so basically i need to ship your 27$ back + 50% of any profit i have made/if i made any profit? If you can clarify exactly what i have to repay back, meanwhile you can proceed on the transfer, i definitely agree whatever your rules are bro. No u dont havta pay me back we just split any profit if i lose i lose.